The Allan Block Blog: What is Geogrid Reinforcement? Geogrid reinforcement is really amazing stuff. Since its North American introduction in the early 1980’s, geogrid can be commonly found in many different types of construction projects, not just Segmental Retaining Walls (SRW). Geogrid has revolutionized the soil stabilization industry which includes substructure design for roadways and building foundations and slope stability design among many others. 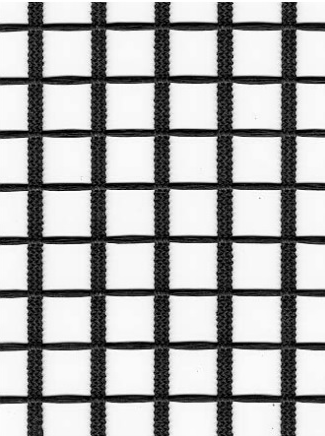 The most common geogrids are made from polyester fibers that are coated in polyethylene. The coating makes them resistant to degradation and the polyester fibers are very strong and resists tension/shear force in soil similar to how a reinforcing steel bar will do when cast into concrete. 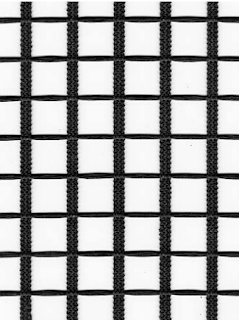 Geogrid typically has woven strands of fibers in two directions; transverse and longitudinal (or in the roll direction or sometimes called the machine direction). Geogrid rolls are typically manufactured in 6 or 12 ft wide rolls and have as much as 250 ft on each roll. Lightweight geogrids are very commonly Bi-Axial, meaning that their transverse and longitudinal strands are the same strength and these grids are more common in residential applications. Commercial strength geogrids are Uni-Axial meaning their longitudinal strands are stronger than the transverse strands. Using these Uni-Axial geogrids in a retaining wall means that you must roll the grid layers out perpendicular to the wall so the strong members are running perpendicular to the wall providing the most shear strength to the wall structure. The weaker transverse strands play a very important role in the grids function as well. They are woven to the longitudinal strands to keep them aligned and they add lateral soil pullout resistance when embedded in the soil mass. For more information on what Geogrid is and how it works please see our website at www.allanblock.com.